Loopy Kennard , or to give him his full title, Sir George Arnold Ford Kennard, 3rd Baronet, was a formerly a Captain in the 4th Queen's Own Hussars and was taken prisoner at Kalamata, in Greece, in June 1942 along with most of the regiment. I first met him in 1946 when he took command of "A" Squadron and I was a lowly Tech Corporal. 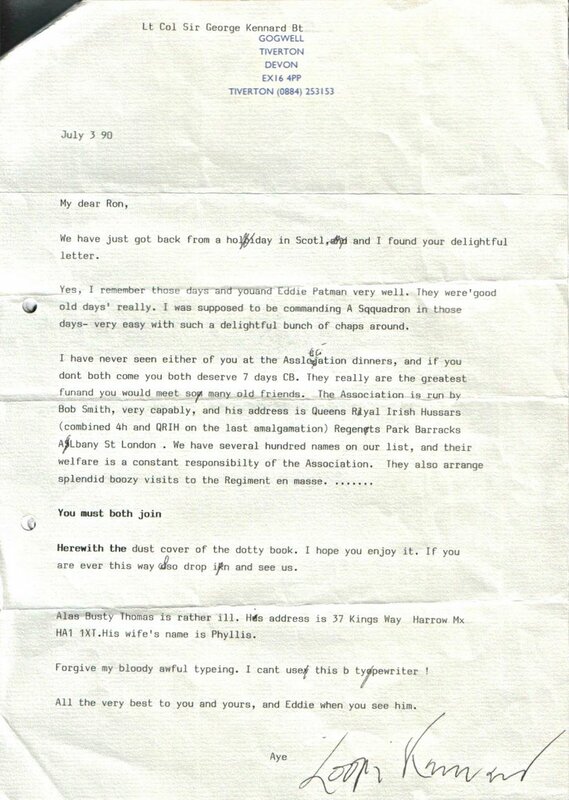 In 1990 he publish his autobiography "Loopy", I wrote to him and, in return, received his delightful reply. Loopy died in 1999 and his obituary in the Times and Telegraph made good reading. This is a full half-hour programme, found by Ron. I've also added it to our links. On a previous posting I mentioned my weekly visits to Lew (Larry) Fox and our going through his box of "treasures". On the 23rd RHQ moved to Hammamet. The two btys exercised with their bde gps. On 26 Jun 280 Bty arrived at Hammamet from Algeria with 38 Bde Gp. I find it quite fascinating to be able to "dot the i's" after sixty odd years ! In the course of researching some events during and after WW2 I came across an interesting family 'Christmas story' in the West Cumbrian local newspaper 'The Whitehaven News' from Thursday 19 December 1946. This was about the local supply situation of Christmas trees, mistletoe and holly. Many servicemen had only returned to civilian life during 1946. For many families this was the first time in many years they would all "... be home for Christmas" but it seems there was a shortage of many of the basic decorations people wanted for their homes. 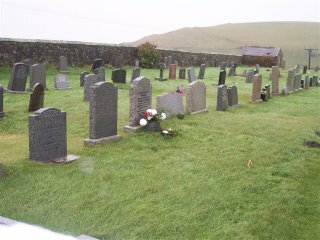 Photograph of Moresby Churchyard with the Lowca Pit spoil heap in the distance. As I live in a former coal and iron ore mining area some of the stories I posted to the "People's War" website inevitably dealt with people and events that took place in the mines during and immediately after the war. For example my father, Joe Ritson, and his eldest brother, Tom Ritson, worked as full-time miners in West Cumberland. 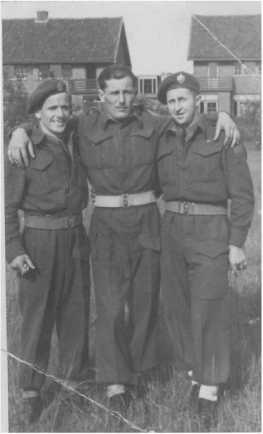 In addition to doing what was a physically hard and potentially dangerous job my father, uncle and most of their workmates also served in the Home Guard. They were but two of the full-time miners whose wartime contribution has been largely forgotten and rarely referred to in wartime histories. This is one of the most heartbreaking stories you'll ever come aross -especially if you are a parent. Last week a 25 year-old woman on a sailing ship was washed overboard off Cape Cod and lost at sea. She turned out to be the daughter of Bob Gainey, the General Manager of the Montreal Canadians hockey team and a member of the Hockey Hall of Fame. As a player Gainey had a stellar career and went on to coaching and management after his retirement. In a sport that is often dominated by hotheads and hucksters. Gainey, who lost his wife to cancer 10 yers ago, is generally regarded asone of the more thoughful, well respected people in the game, the "strong, silent type" who shows little emotion. Bob's father, Tom Gainey, served with the Hastings and Prince Edward Regiment and was a close friend of my dad. This photo was taken in Harleem, Holland, May 28, 1945. My dad is on the far left in the picture. The man on the right may be Tom Gainey, but I'm not sure. 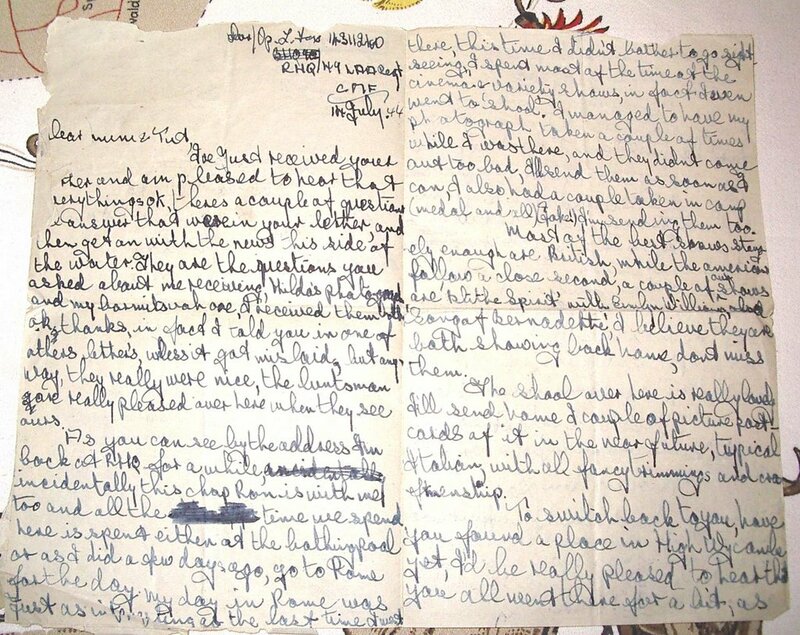 Looking at Lew's "Air-Letters to Home"
Almost every Wednesday morning I drive to Edgware to visit my friend of some sixty-three years. In theory, I am there to teach him computing but invariably he greets me at the door by saying "You've just got to see this Ron" and once inside his house out comes his box of memories and he will show me something I hadn't seen before. 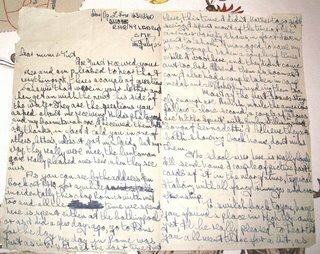 Today, for instance, he showed me a bundle that consisted of every air-mail letter that he had ever written to his parents back home. 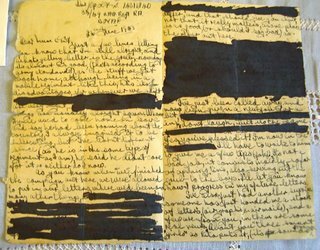 I've added a link to an interesting WW2 website found by Tom. I haven't checked all of it, but it looks fairly well-balanced and informative. Let me know what you think. The list of permanent links is now rather long, so I have altered the layout and, by re-coding, I've moved the FAQ and associated link to the top of the column. Just in case anyone considered the article’s title a little bit over the top may I take a few minutes of your time to tell you about a dear old friend of mine who was a former C&BG Boy's Club manager and who sadly passed away last week. The words are taken from a speech made to him in 2004 by Bryan, one of his sons, on the happy occasion of Derek’s 90th birthday..
After marrying Frances two weeks after the outbreak of war, Derek had what people tend to describe as a ‘good war’. He joined up as a soldier in the Kings Royal Rifle Corps where he preferred the company of the other ranks to that of the officers. 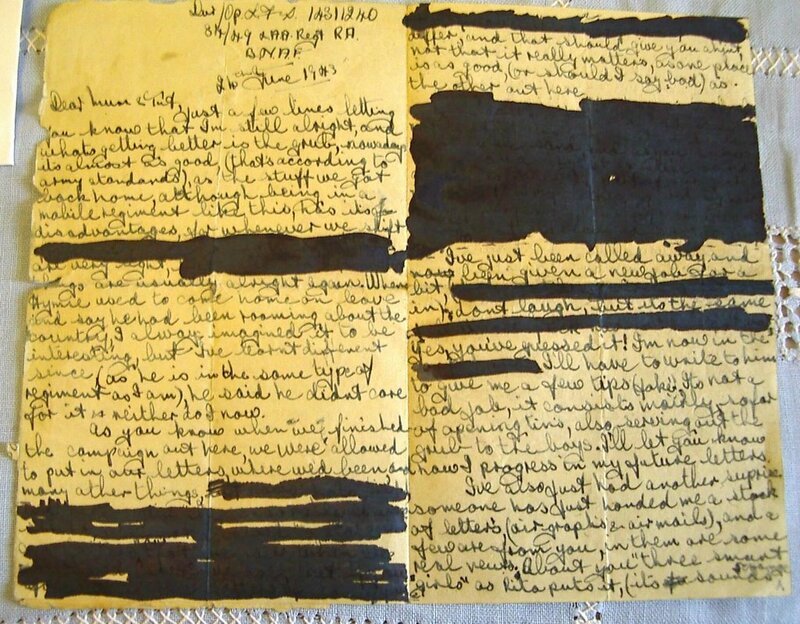 Derek’s experience of the second world war would seem to give substance to the view, expressed by someone (Norman Mailer, perhaps), that war consists of long periods of boredom and discomfort followed by short periods of intense excitement and fear. The early part seems to have been spent in camps in the remoter parts of the English countryside engaged in ‘manoeuvres’ and preparing for action. Things improved a bit in 1943 when one of the regiment’s senior officers, one Anthony Eden, discovered Derek’s proficiency in French and sent him to London to serve at the Supreme Headquarters of the Allied Forces in Europe under General Eisenhower. He was later deployed on a special assignment which entailed him being disguised as a French businessman and billeted with Dr Ninet and his family at no. 11 Avenue Hoche in Paris. From there he acted as a kind of middleman between the Allied suppliers of weapons and the Maquis resistance, speeding, no doubt, the liberation of the French. For his exploits he was well decorated. These included two stars for his service in the war, the Defence Medal and from the French government something called Reconnaissance Francaise. 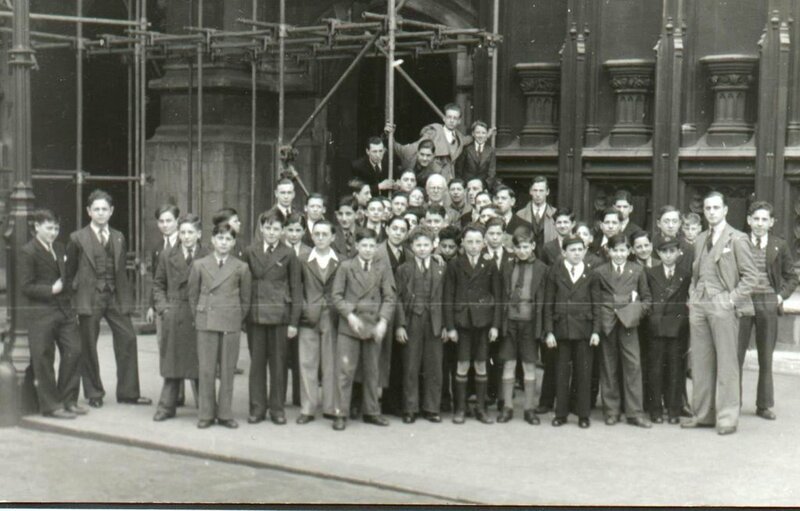 In the photo above, taken at the House of Commons in 1935, Derek is the dapper young man on the extreme right of the front row while a 12 year old Ron Goldstein is two boys away to his right, also in the front row. 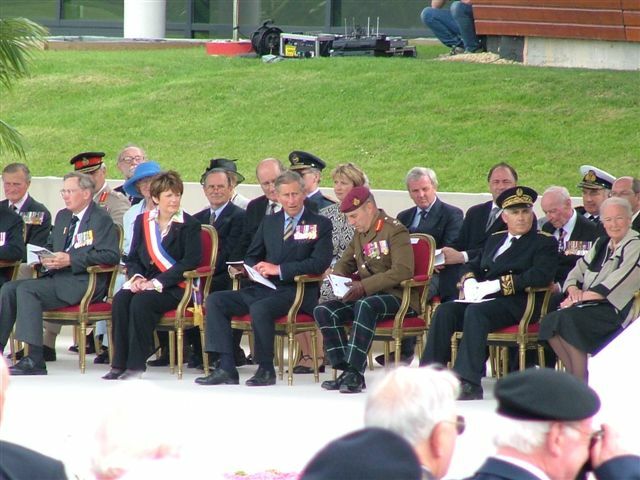 The above photograph was taken at the opening of the 'British Peace Garden' at the Caen Memorial Museum on the Saturday afternoon of 5 June 2004. As well as the VIPs shown in this photograph, there were many more VIPs present at this Ceremony: actual British veterans who took part in the Battle of Normandy. I have some photographs of these other VIPs but I felt it better to select this one as some of the people might be rather better known to others viewing this story. For those who might reside in North America, an 'American Peace Garden' and a 'Canadian Peace Garden' had already been made at the Caen Memorial. Both of those two Peace Gardens are at the rear of the building. The British Peace Garden, opened to co-incide with the 60th Anniversary Commemorations of D-Day, is adjacent to the front of the Memorial. The event was planned about a year previously. The pre-publicity said that 'a member of the British Royal Family would be present'. I am not actually sure when it was decided Prince Charles was to be the main guest of the Mayor of Caen, Madame Brigitte le Breton but it only seemed to be officially announced a few days earlier. It is often difficult to get to these events, especially with VIPs present, particularly because of the security arrangements. Access to this event was by ticket only and went mainly to wartime veterans, their families or people travelling with them. A few weeks later, I returned to the Caen Memorial and went to the British Peace Garden on my own. 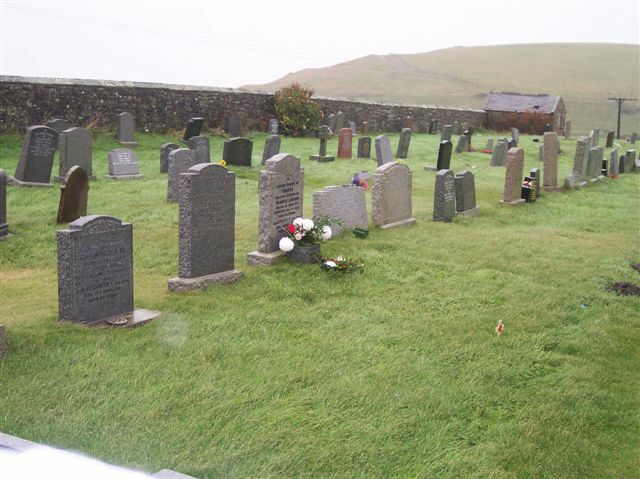 I placed a poppy cross in the ground to honour those who had given their lives in WW2 in the cause of Peace. On 6 December 2006 there was a news item about the Arctic Convoy heroes finally receiving some long-overdue recognition. A number of Second World War Veterans of the Arctic Convoys, who carried much needed supplies to the Soviet Union were finally given a medal in recognition of their war service. While some of the veterans were proud to accept the award, according to the news report I saw there were others who felt for an official award it was rather an insult for their effort and the sacrifice that some of their mates had paid in doing their duty. Apparently the actual award is about the size of a penny (the smallest British coin for anyone outside the UK reading this). Small though it is, and late as it is, at least it is some recognition of some brave souls whose wartime efforts have been largely overlooked until now. It is better to get some recognition now rather than in 40 years time when all the veterans will have passed on. As for the size and value of the medal - what is the intrinsic value of a Victoria Cross? The recognition is surely the important thing?